I love this show. Period. Now back when I first started this blog, I said this about joining the legion of people who already have a blog. Well, the same thing applies to me joining the ranks of fanatical Mad Men fans who have professed their love of the show, which explains the post heading. Once again, I am the latecomer to the party, but I make no apologies for that. I'm not even sure where to start regarding my love for this show, except to say I love this show. Love it. To be clear, I love this show. Not sure why all of a sudden I need to shout this from the rooftops, but there it is. Maybe it's withdrawl symptoms now that season five is over. Maybe it's the fact that I have a long and not entirely patient wait until 2013 for season six. Whatever the case may be, I'm a little shocked and amazed how I ve completely taken to this show. I was hooked from the first episode back when I started to watch the show in late 2008 (it started 2007). I was hooked. Completely. Anticipating each episode. Looking forward to the various exchanges and scenarios between the characters at the office and at home. Babbling about it to friends and family. Becoming anxious, and yes quite emotionally invested in the fictional lives of Don, Peggy, and yes, even Betty. Watching the evolution of characters such as Joan and Pete. Watching people come and sadly go - Sal (still miss you!! ), Kinsey, Lane, the amazing Bobbie Barrett, between seasons. Making time every Sunday to ensure that I don't miss an episode. Downloading the episode on Itunes so I can watch it again the next day (and the next). Jumping to some of my favourite sites to read what others have said about the episode. I have devoured every inch of this show, from the dialogue to the fashion to, of course, the food (and drinks - this lounge in Berlin made a very satisfying old-fashioned - UPDATE 2013, the bar has closed and will re-open as a restaurant - shame really). I'm often amazed, but not surprised of the efforts that the show creators have gone through to recreate certain dishes (yes Trudy, I noticed the Beef Wellington you made on the table during the dinner scene in Signal 30, check out the pic above, bottom right corner, to see what it looks like - that is one hell of a dish to make and takes SERIOUS dedication!!) No show has focused on 1960's cuisine quite like this one. 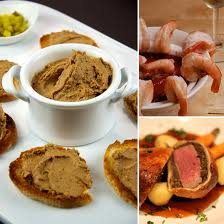 It has completely revived interest in recipes from that period. My Mum has a ton of recipe books from the 60s, and having gone through some of them, I'm not sure whether to be hungry or horrified - but then who would or could say no to a devilled egg? Who I ask you? Ok speaking of devilled eggs, check this recipe for Devilled Eggs. And if you're feeling really, really adventurous, here is a very good Beef Wellington recipe. This site is amazing! I came across it during one night of "researching" Mad Men articles to read(yes I know;(1) this time for "research" may or may not indicate that I really don't have much a life and 2) did I not say I was addicted to this show in the opening paragraph?). It not only documents the New York restaurants that are mentioned or recreated in the show, but it also provides detailed descriptions, backgrounds and pictures of what has happened to them since the 60s (if any have closed or are still around). Fascinating! Well, at least for me anyway. For other great Mad Men fan sites: Check this site! Tom and Lorenzo offer great episode backgrounders, and the best part is their analysis of the shows detailed, amazing and transforming 60's style. Alan Sepinwall is one of my favourite Mad Men Writers, you can check him out here. Of course, I can't forget the site that started it all: the fantastic Lipp Sisters. There are a ton of other great sites out there like Vulture, and Slate, so be sure to give them a read as well. 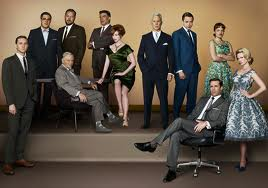 Ok, the Mad Men love-in is over (for now...). I am getting in touch with you as I am looking for quality websites such as your ahungrymantravels.blogspot.com, such as yours, to place some adverts on your website and would like to know if this is something which would be of interest to you? Please send me your email address and Ill be happy to discuss this with you!